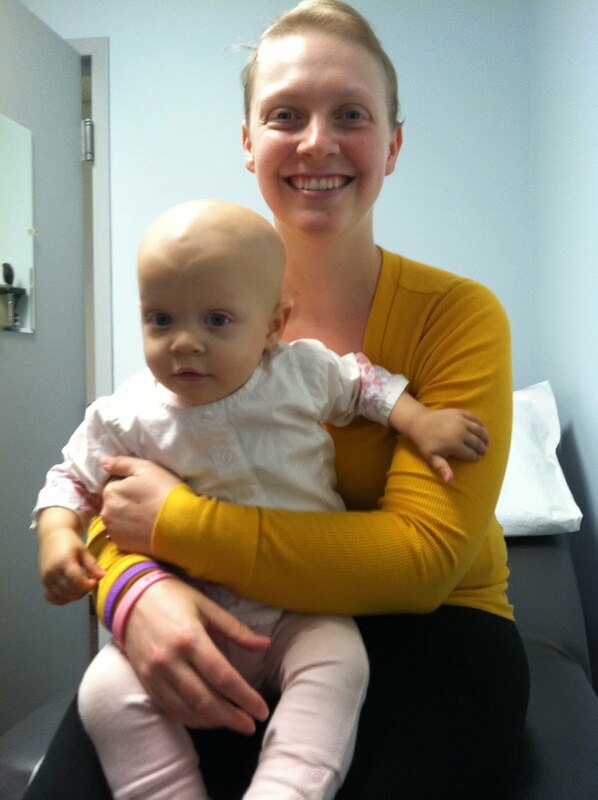 New Mom ..... New Cancer: A Sneak Peek at "Normal"
All things considering, the past two days have been pretty good. The only appointment we had on Monday was with the Audiologist. Saoirse has some fluid in her ears (she's congested, there is no infection), so her ambient hearing is a bit low, but her bone/nerve hearing is perfectly fine, so we are not concerned at this point (I think my head is full of fluid right now. The hospital air seems to be aggravating all of our allergies). Saoirse ate a lot of food yesterday (I keep feeding her to help prevent nausea), and she had some playful moments. She really likes the keyboard in the playroom, and we were able to go outside in the garden and enjoy some of the nice sunny weather. Today was about half and half. She had a bone scan scheduled, so she was able to eat breakfast, but could not have lunch. The morning was great! The IV that had been put in her hand when we arrived had stopped flushing, so it was removed when she got up. I think this was her favorite part of the day, because that hand had really been bothering her. She ate a pretty normal breakfast, and we walked around the halls a bit, and visited with some of the nurses (it was early, most of the kids were still sleeping). We came back to the room for a bit and played. She was laughing and enjoying looking out the window, and having fun playing with tissue boxes and plastic bottles (who needs toys, right?). I was able to get some great pictures of her having fun. She went down for a morning nap, but ended up being disturbed when her radioactive injection came for her bone scan. I couldn't get her back to sleep, and needless to say it was a rough afternoon of crying and fussing (Saoirse does not do well not sleeping, and she couldn't eat either). We walked and rocked, and I tried to distract her as much as possible. She took a cat nap and noon, and it seemed to perk her up enough to be happy for a bit before her scan (which was running late). She even made a friend - a little boy about 4 years old who is also being treated for Neuroblastoma. She was thrilled watching him play trains. Her bone scan went well. They did NOT have to sedate her, which is good. She wasn't a huge fan of lying there, but there was quite the entertainment team singing and dancing to distract her (and it wasn't even me and Tabitha). Mike got here during her second nap, and when she woke up she ate a nice meal and got in plenty of daddy time. It is comforting seeing her get back to her old self, playing and laughing and being social. The environment here is so great, and it makes it easy to help her get a bit of "normality" in a hospital setting. I hope that each day we see more and more of her personality come back through. Once she has the IV out of her food I'm sure she will be off and running. I think we'll have a lot of our little girl back by the time we get home. You have an inspiring, positive spirit and amazing family - a great combo to get you through this. Many thoughts and prayers are with you...please continue to post your journey. Can't wait to hear you laugh (WITH me, right?) in class again.